The Grand Gulch Cedar Mesa Plateau is a unique area for exploring. This is a place where cultural resources are found in remote, primitive and wilderness-like settings. Click the YouTube icon below to watch a short video on "House on Fire." The House of Fire is located between Blanding and Natural Bridges National Monument on Rt. 95. While the hike to this location is easy getting you to the dirt road that turns off Rt. 95 is the hardest part. 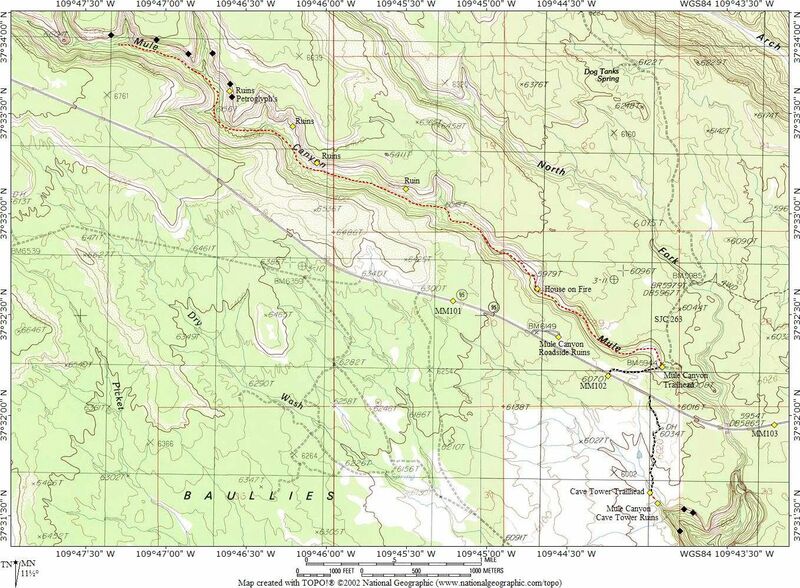 This location requires moderate route exploration and is marked on the map downloadable map. Select the green “View Map” tab to view this location on Google maps. Coming from Blanding on Rt. 191 turn west onto Rt. 95. The unmarked dirt road will be 19.3 miles on the right side. If you come to a visitor picnic area (on the right side) you have gone .5 miles to far. From Natural Bridges National Monument take Rt. 95 East, the dirt road is approximately 9 miles past Rt. 261 and .5 miles past the visitor picnic area (the visitor area and dirt road are on the left). After making the turn onto the dirt road the trailhead will be .3 miles ahead on the left. It will be marked with a message board and a sign in sheet. From here, the hike will take you .9 miles (one-way) up a dry riverbed. 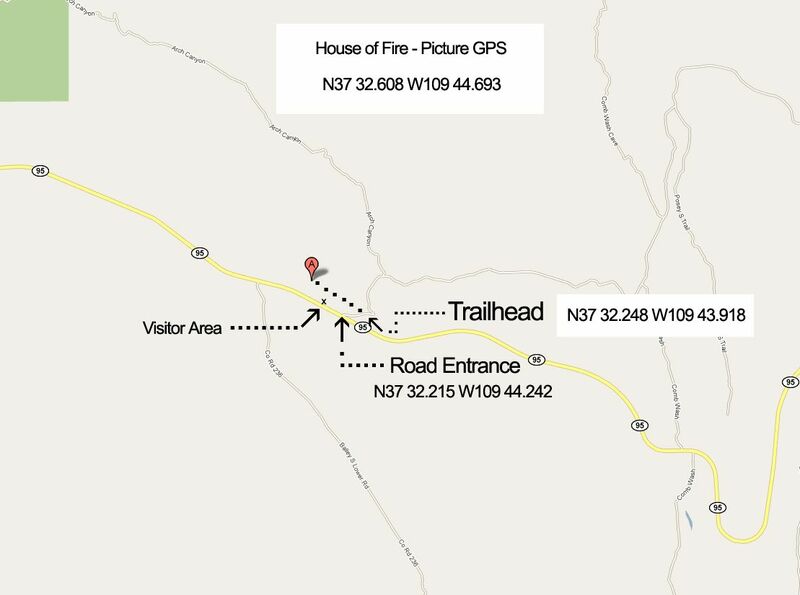 The hike is flat and easy but pay attention because you can walk right past the House of Fire so be sure to keep looking to your right (and up about 20 feet). Download a free copy of the Four Factors of Filter Highlight Photography in PDF format by selecting the “ebook download” tab above. This 37 page guide covers how to take a single image and apply minor manipulations that will help you produce consistent reproducible results. You will also learn the processes of camera set-up, image editing, and advance scouting techniques used by professional photographer Christian James. Free park maps, tide tables reports, ebooks and additional information can be found under the Maps and Resource tab located in the black bar at the top of the screen. The best time to visit/photograph is from 10 a.m. to noon. If conditions are right, the sunlight will bounce of the floor/ground and illuminated the overhang making it look like a flame. Nikon D3x 14-24mm Lens @ 14mm f11 @ 1/40 second ISO 100 Exposure Value -2.0 with a 3 Stop (0.9) Soft-Step Spilt ND Filter. 9/8/11 11:11 a.m.